How to buy the right Pillow for Sleep Apnea & Snoring? Selecting a pillow to suit the needs of a person who suffers from sleep apnea or has trouble preventing them from snoring during the night can be difficult, as there are issues at play that cannot be fixed simply. However there is an alternative in the form of a special pillow designed for such an occasion. Sleep apnea pillows should help to alleviate some of the issues but are not necessarily the solution to the problems of snoring and sleep apnea. They do offer a lot of features that can assist the problem and are widely recommended as aids to other forms of assistance in the form of sleeping masks or respiratory devices. It should be mentioned that consistent issues with sleep apnea or snoring should always be investigated further by visiting your doctor or local general practice. This can help to pinpoint the route cause and also assist in the process of improving the situation for the person who is currently being affected by it. What features should this pillow include? The design of the sleep apnea pillow is perhaps the cornerstone of how it works. You can’t have a pillow that will combat sleep apnea or snoring that is not shaped or designed in a specific way, otherwise it is just simple pillow that is the same as every other pillow out there which does not aid your symptoms. These pillows are designed with this goal in mind and are created with specific precision to ensure that they provide some form of assistance. It is however slightly confusing sometimes when trying to determine which the best design for the pillow is and which the best is for you. These pillows are mainly designed for sleeping on your side. This is done at your own benefit, as this allows for better respiratory airflow. As a result, it is recommended that you avoid sleeping on your back, as this can affect the way in which you breathe during sleep and negatively affect the impact of the apnea pillow. Comfort is another area of which you will want to be sure your sleep apnea pillow ticks all the boxes. It is infinitely more difficult to get a good night’s sleep when you are not comfortable, and a lack of comfort can also prevent you from being able to breathe properly when using the sleep apnea pillow. Most specialized pillows will use memory foam as part of the main material used to keep them in top condition. The memory foam helps to give the pillow a soft and secure feeling whilst also providing optimum support for your head, neck and spine whilst you rest on your side, as well as allowing for a sleeping mask to be worn as well. Price is another feature that you should consider. In some cases you can find sleep apnea pillows that range upwards of $100, although in most cases these are very specific and specialized pillows. You should aim for a price of around $50 to get a good even spread of features available as well as value for money. It is also wise to consider the available sleep apnea pillows that are offered alongside certain sleeping masks. In some cases the pillow is designed to complement the mask and this would be a better item to select with a mask as opposed to purchasing a different sleep apnea pillow that is separate from the mask. What are some pillows I should consider? Designed mainly for sleep on your side, this pillow helps to prevent pain from arising in the morning because of its shape, which offers much better neck and head support through the night when you sleep. If you wear a mask when sleeping (the one designed for sleep apnea), it also helps in making your sleep much more comfortable. Comes with a custom pillow case to ensure that it remains clean whilst in use, the design is simple and efficient, which cradles your head and offers proper support whilst you are sleeping. This in effect makes it much easier to sleep and much less uncomfortable. Additionally it is machine washable, ensuring cleanliness and hygiene. Made with cotton and designed to specifically help with snoring and sleep apnea, this pillow is filled with a soft fiber, which offers both comfort and firm support for your head. 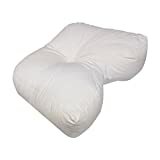 Additionally the contoured design gives much easier breathing alignment when on your side, and the pillow is machine washable to keep it clean and easy to maintain. Key Takeaway: Sleep apnea and snoring can be a difficult issue to deal with for all people involved both the sleeper and the surrounding people included. With the use of a sleep apnea pillow, you want to ensure both a comfortable and easy night’s sleep for the user as well as peace and quiet for the people sleeping around or near the person. When selecting your pillow, always keep in mind that you are the one who will be using it and from the points mentioned previously, it should be the optimum for your situation. With the items listed, it should be relatively simple to select the best pillow to help give you the best night’s sleep.